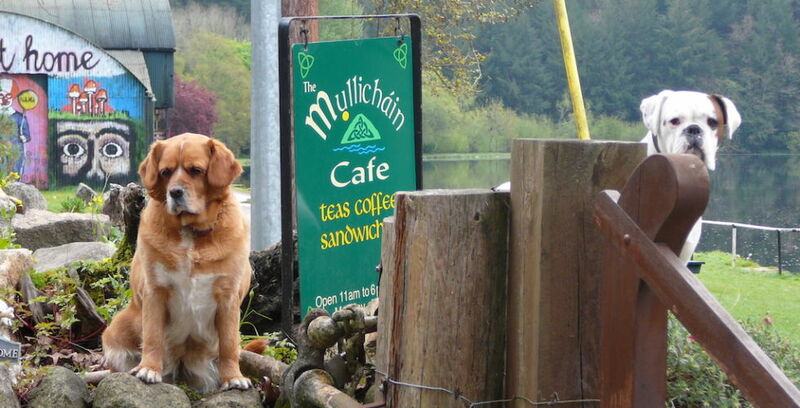 The founders of Mullicháin Café in Carlow describe how they left Dublin behind to pursue a dream along the banks of the river Barrow. In 1999 at a local auction, Martin and Emer O’Brien decided to purchase an old 18th century, four-storey, canal storehouse that was in need of repair. 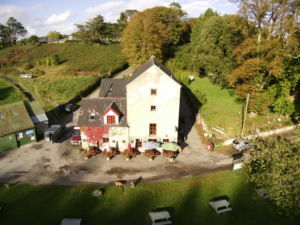 A decade later they converted the bottom two stories of the building into the Mullicháin Café, a unique and now well-established café, located on the quayside at St. Mullins in Co. Carlow. It was an auspicious time to invest a redundancy package and start a business, in the economic shadows of 2008. 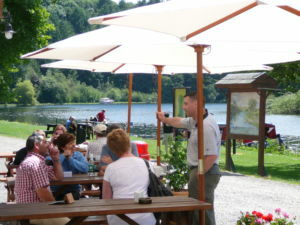 The village of St. Mullins is located in the southern-most tip of County Carlow, on a quiet stretch of the river Barrow, between the towns of New Ross and Graiguenamanagh. Martin and Emer recall how they left Dublin, to follow their dream of starting a cafe, just a stone’s throw from the centre of this ancient and historic settlement. I started off my career working in the Gresham in hotel management, followed by a period in racecourse catering management and finally as sales manager in the pharma sector. Emer had graduated from Cathal Brugha Street with a background in catering and teaching. Along the way both Emer and my sister were also quite innovative, selling Aran Island sweaters, during six-week sales trips to US retailers, back in the 80s. In our twenties, we both enjoyed playing hockey and rugby and took our respective sports quite seriously. At the time I was playing rugby, but I really wanted a job where I could work and still have time to train and play matches. I was fortunate to secure a position as a sales manager with a German pharmaceutical company, where part of my brief was to organise medical conferences around Ireland. 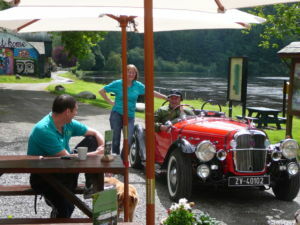 Why open a business in St. Mullins? The main historic route into St. Mullins has always been by the river, along with being a vital access route to the local monastery, founded by St. Moling in the 7th century. 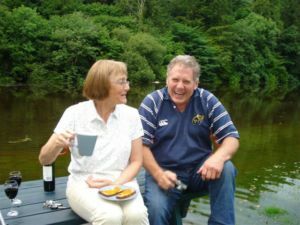 Both of us enjoyed down-river canoeing, and when our kids were small, we would start off on the Barrow River at Maganey in Carlow, with our Canadian canoes. We canoed, paddled and camped all the way down, eventually ending up staying with Maggie O’Dwyer in her B&B, which was our first real introduction to St. Mullins. I can remember saying to Emer, “If the opportunity arises, I would like to buy something down here”. Then in 1999 serendipity intervened, a derelict property appeared for auction in the local paper – and so began the fulfilment of a dream. People always thought that St. Mullins was a bustling place, but when camping out on the first floor of our derelict building, we could see the reality with our own eyes. Generally, it was hushed, except on our saint’s patron day which is still held every July. Nevertheless, we believed that St. Mullins had real potential. In 2007 I was based in Dublin and the pharma sector in which we operated, was becoming more challenging and beginning to shrink. After twenty-eight years with the company, I looked for and accepted a redundancy package which meant, that I could invest in the business without the need to borrow. We went on to spend the entire package creating some self-catering apartments, as well as doing up the coffee shop. Then in March 2009, we opened up our doors to the public. Initially, it was just the two of us and a couple of local ladies who ran the show. At the start, we really had to cut our cloth, as people didn’t have the money to spend or were afraid to spend it. We were fortunate because if we had borrowed, we wouldn’t have been unable to meet the payments. Our fall-back was that if it didn’t work out commercially, we could always close the door with the option to live here instead. This meant that although we wouldn’t need to sell up, we would be very unlikely to get our money back. Fortunately, year-on-year business has been increasing, mainly through word-of-mouth and through the use of social media and digital marketing. Over the years we have also been fortunate to be profiled on the likes of RTE’s Nationwide, Tracks and Trails, Carlow Matters and the excellent local ‘Discover Graiguenamanagh’ tourism video from 2014. What’s different about your café? It is a seasonal business, and we open six days a week, from Tuesday to Sunday, 11am to 6pm from the first week in March until the end of October. It’s family-run and specialises in quality home-baking. Accessibility is essential, in particular for older people. We also provide ground floor wheelchair access to our toilet facilities. It’s also the only café located on the Barrow Line, which refers to the tow-path on Ireland’s second longest river. “We employ a lot of local students who have been instrumental in the success of the café. People know that when they arrive here, that they will be well looked after and can be sure of a warm welcome from us”, says Emer. Recently the biggest frustration we experienced was wasting €10,000 on applying for planning permission, to develop some of our sheds and convert them into a hostel. We felt we were almost there, but unfortunately, at the end of the day, we were turned down. There seemed to be a lack of sufficient encouragement along with too many obstacles appearing in our path. 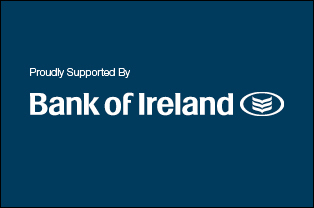 In general businesses in rural Ireland are finding the going tough and need all the support they can get. A key challenge for us is ensuring that we have consistent customer footfall during the day to allow the business to perform at a constant level. That’s why we support initiatives such as the Blueway, Ireland’s Ancient East, the promotion of local history and the many outdoor activities. Staying at a rural backwater hinders the flow of money that can filter into the local economy; and student summer work can help defray third level college expenses, in an area with limited employment opportunity. A lot of people in family businesses hope that one day they can pass the business onto their son or daughter. However these days, that appears to be happening less and less. Luckily in our case, it has happened, when five years ago our son Mark joined us, to take over and manage the business, on a day-to-day basis. “Every day we pinch ourselves, with what we have here right now. It’s the success and enjoyment we experience, along with the fantastic support that we receive from people in the local community and beyond. It’s really what makes, what we do here, all the more worthwhile,” says Emer.